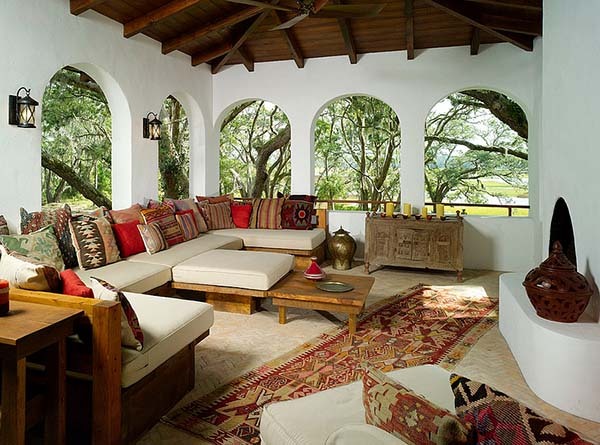 Moroccan-style patios are an elegant, colorful, and charming retreat that can add exotic touches and personality to any home. With their bright colors, low tables, ottomans, and rugs, Moroccan-style patios are elegant, fascinating, and mysterious. 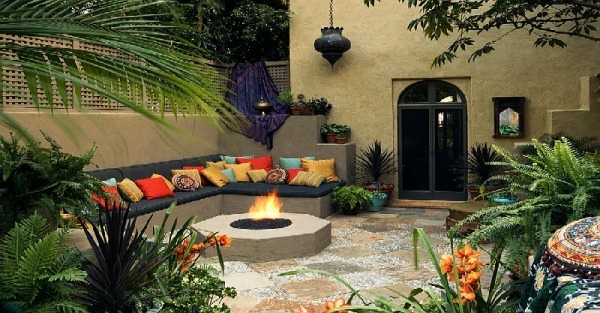 Actually, it is not that difficult to recreate a Moroccan-inspired patio! Incorporate intricate patterns, colorful tiles, plenty of bright fabrics, and lush greenery…and voilà: you will have a truly exotic retreat. 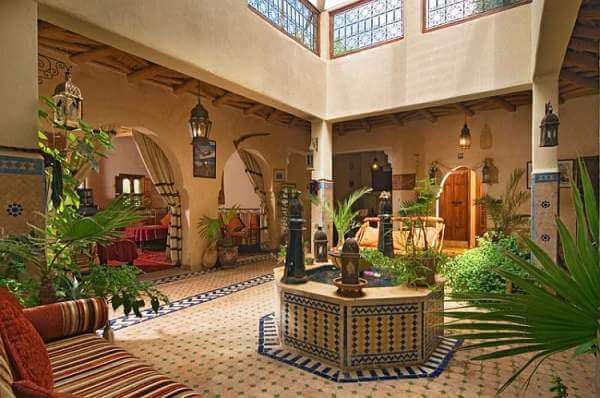 When it comes to Moroccan-style spaces, always consider adding lanterns. Made of metal or glass, with a candle inside, they are an inherent part of the unmistakable Moroccan look. 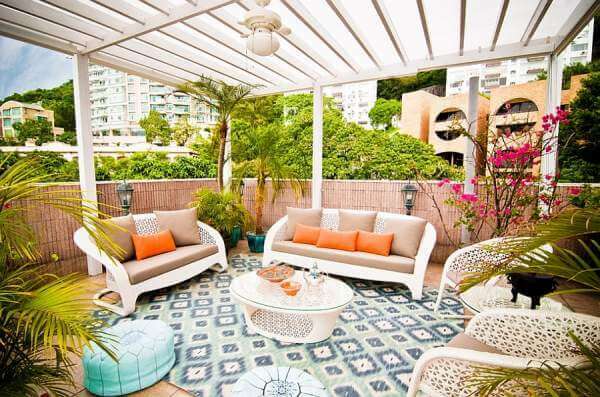 There is an array of ways to decorate a Moroccan-style patio. However, vibrant colors, eye-grabbing geometric patterns, ottomans, and luxurious fabric are must-have elements. Use colorful tiles, lanterns or lantern-style lights, natural greenery, any kind of water feature, floor cushions, and silken fabrics to lend the space the enchanting, unmistakable Moroccan look. In case you are not ready to completely commit to a Moroccan-style space but are enchanted by its vibrancy and exotic look, then opt for some subtle Moroccan accents. Glittering trendy lights and stylish ottomans will do the job. 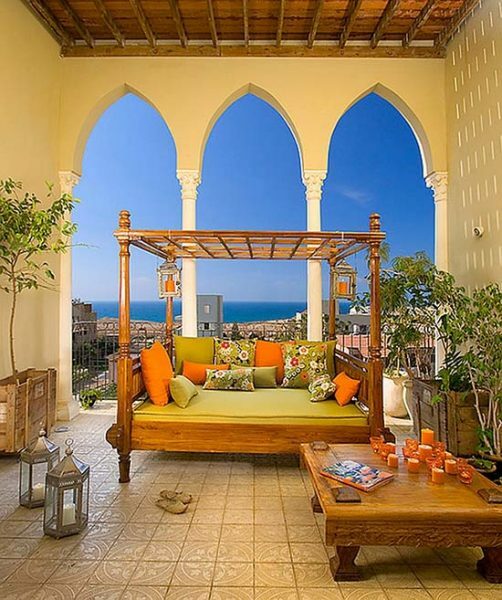 Blend elements of other exotic styles and infuse some Moroccan accents to create a unique space and add personality to your outdoors. As all these unique themes work well together, and Moroccan design is all about the finishing touches, boldly mix natural bamboo and minimalist approach for an Asian-inspired look and enliven the space with Moroccan accents. Versatile, appealing, and exotic, Moroccan style is becoming increasingly popular in modern homes, and with good reason. It offers different elements that can easily become a dramatic statement, such as intricate tilework, vibrant geometric patterns, and distinctive pieces of furniture with elaborate motifs. You can also use leather ottomans, which add to comfortable seating areas, traditional wedding blankets that can serve as bed covers, wall hangings and rugs to bring in charm and personality. Think outside the box! There are endless gorgeous options to use Moroccan-style accents to add touches of luxury, elegance, and mystery to your outdoor space.